Dallas, USA - July 26, 2018 - A Lockheed Martin (NYSE: LMT) PAC-3 Missile Segment Enhancement (MSE) interceptor successfully intercepted an Air-Breathing Threat (ABT) in a test at White Sands Missile Range, New Mexico. The test marked the furthest distance a PAC-3 MSE missile has intercepted an ABT, which represents fixed-wing aircraft or cruise missiles. A Lockheed Martin Patriot Advanced Capability (PAC-3) Missile Segment Enhancement (MSE) interceptor successfully intercepted an Air-Breathing Threat (ABT) in a test at White Sands Missile Range, New Mexico, USA. 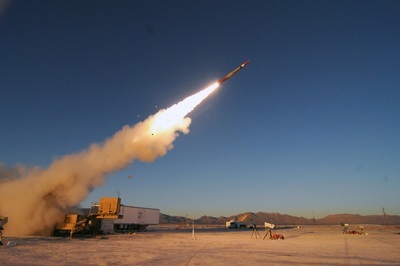 A Lockheed Martin (NYSE: LMT) PAC-3 Missile Segment Enhancement (MSE) interceptor successfully intercepted an Air-Breathing Threat (ABT) in a test at White Sands Missile Range, New Mexico. The test marked the furthest distance a PAC-3 MSE missile has intercepted an ABT, which represents fixed-wing aircraft or cruise missiles. 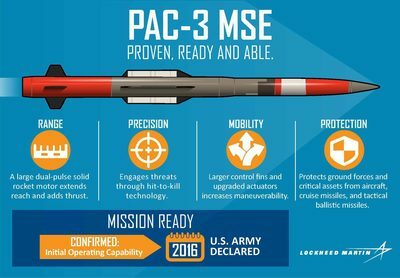 Lockheed Martin's Hit-to-Kill Patriot Advanced Capability (PAC-3) Missile Segment Enhancement (MSE). The U.S. Army-led missile defense flight test demonstrated the unique Hit-to-Kill capability of the PAC-3 family of missiles, which defends against threats through body-to-body contact. The test also reconfirmed PAC-3 MSE's ability to detect, track and intercept incoming ABTs or missiles. The test was observed by representatives from the U.S. Army and a current Foreign Military Sales PAC-3 MSE customer. Adversaries are acquiring more missiles with better capabilities. That’s why we increased the range and mobility of the combat proven PAC-3 interceptor. With the Missile Segment Enhancement, governments can protect their people from today and tomorrow’s threats. "PAC-3 MSE continues to be successful against today's evolving threats, and this most recent test validates its effectiveness at extreme distances," said Jay Pitman, vice president of PAC-3 programs at Lockheed Martin Missiles and Fire Control. "Today's global security environment demands reliable solutions. We expect PAC-3 Hit-to-Kill interceptors to continue serving as an essential element in integrated, layered defense systems." Lockheed Martin's PAC-3 MSE in flight. The PAC-3 CRI and MSE are high-velocity interceptors that defend against incoming threats, including tactical ballistic missiles, cruise missiles and aircraft. Twelve nations have procured the PAC-3 missile defense interceptor: the U.S., Germany, Kuwait, Japan, Qatar, Republic of Korea, Kingdom of Saudi Arabia, Taiwan, Romania, Poland, the Netherlands and the United Arab Emirates. A world leader in systems integration and development of air and missile defense systems and technologies, Lockheed Martin's experience spans missile design and production, infrared seekers, command and control/battle management, as well as communications, precision pointing and tracking optics, radar and signal processing, and threat-representative targets for missile defense tests. Headquartered in Bethesda, Maryland, USA, Lockheed Martin is a global security and aerospace company that employs approximately 100,000 people worldwide and is principally engaged in the research, design, development, manufacture, integration and sustainment of advanced technology systems, products and services.